Inorganic vitrified bond abrasives are characterised by a porous surface that aids free cutting at the grinding surface. The abrasives are held together by a glass bond, with various clays, frits and other materials used in the bond formulation. During manufacture, the wheels are fired at 1250C. The manufacture and composition of organic resinoid bond abrasives is quite different to vitrified wheels. The wheels are cured at 150C to 200C using thermosetting or organic polymers. The grade of the abrasive is modified by controlling heat resistance and mechanical strength of the bond. Often fillers are used to modify bond properties. Fundamentally, resinoid wheels are suitable for heavy duty applications since they are less brittle than vitrified bond abrasives. Natural or synthetic rubber is blended with a plasticiser to form the matrix for rubber bonded abrasives. 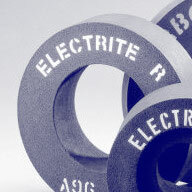 The abrasive grain is added to this, which is typically fused aluminium oxide or fused black silicon carbide, dependent upon the final end use for the wheel. The final step in the manufacture of a rubber bonded wheel is to cross link the rubber through vulcanisation at around 160C.